Wine Coolers And Cellars Maintain Optimal Beverage Temperature For Applications Including Hospitality, Catering, Food Service And More. 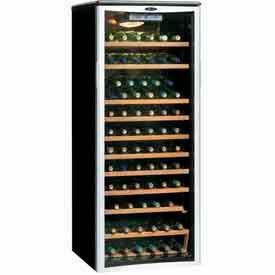 Wine coolers and cellars are made of high quality materials for long lasting durability and dependability. LED lighting system eliminates incandescent bulb heat and showcases contents for inventory visibility. Frost free, fan forced cooling system is available with thermostat for consistent internal temperature stability. Features integrated keyed door locks for added security. Available types include Built-In, Elite Refrigerator, Elite Wine Refrigerator, Wine/Beverage Refrigerator, Wine Cabinet, Wine Cellar, Wine Cooler, Wine Refrigerator and more. Bottle capacities range from 1.80 Cubic Feet/17 Bottles to 171 Bottles. Color finishes are Black, Black/Platinum, Black/Stainless Steel, Platinum and Stainless Steel. CSA and ETL approved. Dimensions vary per model. Wine Bottle Racks are an attractive and safe way to display and store wine bottles. Each bottle is securely cradled by heavy gauge wire to prevent movement. Adjustable shelves allow storage of many different sizes of bottles. Our open wire construction permits air to circulate around the bottles for an even temperature. The 36" wide shelves accommodate 9 bottles and the 48" wide shelves accommodate 13 bottles. Posts include bottom Leveling Feet and top Post Caps. For added protection, place a 4" high ledge along the rear of the shelf. The electroplated nickel-chrome finish is durable, chip resistant and attractive for use in retail display. The use of 188735 Foot Plate is recommended for additional stability. 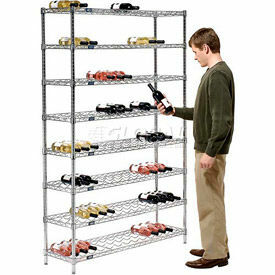 Wine Bottle Racks are an attractive and safe way to display and store wine bottles. Each bottle is securely cradled by heavy gauge wire to prevent movement. Adjustable shelves allow storage of many different sizes of bottles. Our chrome plated steel, open wire construction permits air to circulate around the bottles for an even temperature. 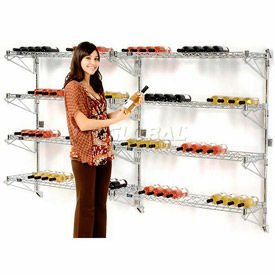 The 36" wide shelves accommodate 9 bottles and the 48" wide shelves accommodate 13 bottles. Wine Coolers & Cellars Keep Red And/Or White Wine At Optimal Serving Temperature For Bars, Restaurants, Outdoor Cafes And More. 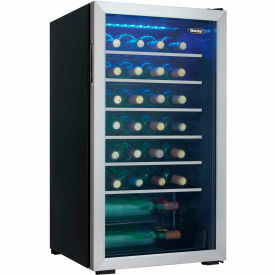 Wine Coolers & Cellars are made with tempered glass door and stainless steel trim to provide long lasting durability. Integrated door locks with key for security. LED lighting system showcases contents without the added heat of an incandescent bulb and to provide easy viewing. Frost free, fan forced cooling system is available with a thermostat to provide consistent internal temperature. Wine Bottle Rack - Wall Mount 36 Bottle 36" x 14" x 54"
Wine Bottle Rack - Wall Mount 9 Bottle 36" x 14" x 14"